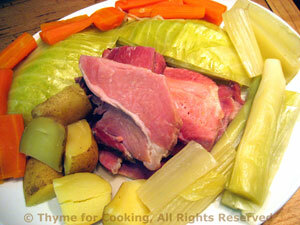 Easy Dinner: Corned Beef and Cabbage, Weekly Menu Plan. This is the traditional Irish-American celebration dish for St. Patrick's Day. I don't recall seeing corned beef in Ireland during the year that we lived there. In Ireland it would be more commonly made with a slab of bacon or ham. And, to be truthful, I used ham as corned beef is not available here. I know St. Paddy's is tomorrow, but corned beef takes a while to cook - and we have the leftovers for Corned Beef Hash tomorrow night!